I have always heard and read a lot about Factorio but never gave it a chance. This all changed when a co-worker could not stop talking about the game. Although the game is still in Early Access, I knew I had to give it a go. And oh boy… It’s a ton of fun! I never expected to be drawn into a game so quickly and end up spending hours on end both playing and learning. I have spent a lot more time reading (or watching) about the game than actually playing it. Whenever I do something, I spend a lot (probably too much) of time working to optimize and perfect solutions. This has already caused me to scrap everything and start from scratch multiple times in Factorio. Fortunately, it’s always a new experience and I can see myself getting a lot of playtime from this game. Read on for my first impressions of the Factorio beta. 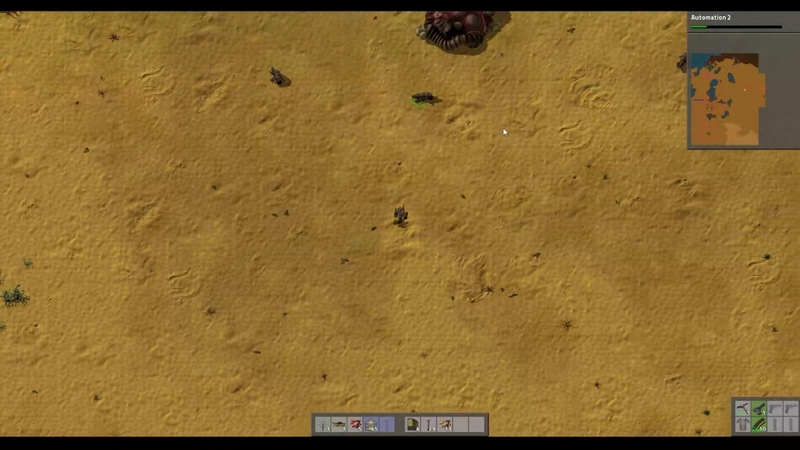 Factorio is an indie simulation & strategy game developed and published by Wube Software. The game is currently in its early access (beta) phases but is seeing major improvements on a regular basis. The highly anticipated version 0.13 is available on the unstable channel for those keen to try out the latest and greatest. I have chosen to stick with the stable branch for this article to avoid any major bugs that may turn myself away from the game. 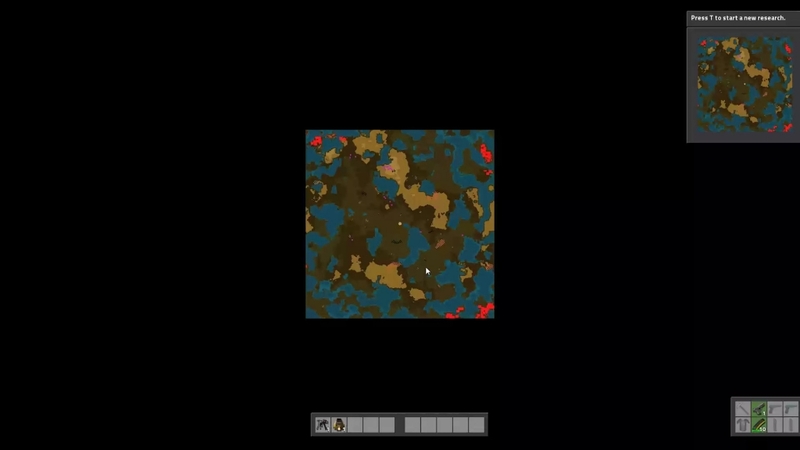 You start on an empty procedurally generated map with nothing but some iron, a gun with ammo, and a furnace in your inventory. You will usually (and I recommend it) begin by using this iron to create a basic pickaxe used to speed up mining and woodcutting. Initially the game moves at a slow pace with the player mining rocks, throwing it into the furnace, chopping food, and using gathered resources to craft items. However, as the name suggests, you will be working towards creating a factory in which everything is automated on production lines. Before you know it, you will be spitting out thousands of items every second. There are various types of machines available which perform one simple task. 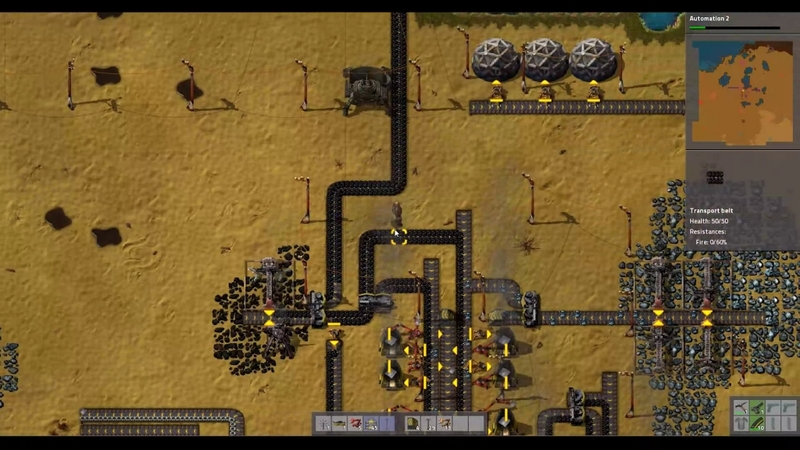 For example, there are inserters which can pick up items and drop items or transport belts which move items in a specific direction. The beauty of this game is that all of these small pieces can be put together to create something amazing. Even in the real world, we may look at some piece of technology and marvel at its complexity and the number of man hours put into making it a reality. However, it all comes down to lots of people specializing in various fields coming together and using small building blocks which result in something amazing. Everything can be broken down into simple pieces if looked at carefully and closely. This same idea is seen everywhere in Factorio. 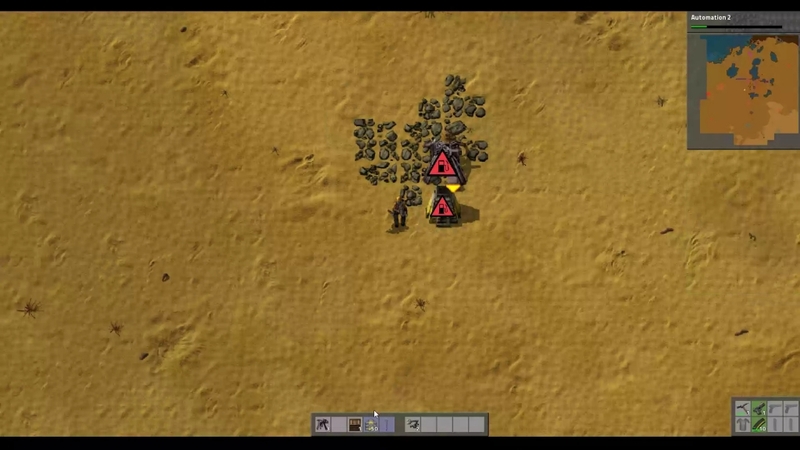 You will use small building blocks such as transport belts, miners, inserters, and furnaces to make something great. Miners can extract material from rocks, toss them onto transport belts, be picked up by inserters, and thrown into the furnace. Essentially, you will have created a production line. The complexity and coolness is slowly built on as additional science is researched and the factory is expanded. By having a procedurally generated world which can be up to 80% the size of Earth, there is not much you can’t do! The problem, however, is that you can never plan for everything (at least not until you are a very experienced player) and you will never reach the perfect factory. For this reason, I see Factorio as being a game of refactoring. I can’t count the number of times I have scrapped sections of or the entirety of my factories. “Why is this transport belt so long? Does it need to be? What if I move the assembly line over a few spaces? Is that better? No? Let’s try again…” Even after you think you are done with the game, there will always be a voice at the back of your head pushing you to make it better. Plus, there are also player mods available when you’re done with the vanilla game (or want to tweak some aspects such as how dark it gets at night…). By unlocking concepts such as Automation and Logistics through the research tree, you can work towards creating a self-sufficient factory. At the beginning of the game, you will be running around moving materials, crafting items, and refueling your machines. My first goal when I begin playing Factorio is to setup a self-sufficient operation using steam engines for electricity and inserters feeding coal into burner machines. Once that is complete, I can forget about what is already done and put all my energy towards expanding my factory and unlocking future technologies. I have not had this much interest in a game for a while. There have not been many games which piqued my interest and ended up devouring it. I made the mistake of picking up this game one night before work and ended up staying up way too late. Even when I hit the sack, I pulled out my tablet and began reading up on the various aspects of the game. The next day at work, in between programming and debugging, I would be looking through Factorio Wiki pages. This game is like a drug; don’t pick it up if you value your spare time. While I am perfectly content with the building and planning aspect of the game, that may just be my engineering background. In order to spice up the game, you are not alone in this world. The planet is inhabited by Zerg-like aliens who abhor pollution. As your factory begins to spit out fumes, affected Zerg colonies will continue to attack until you or they are destroyed. There are entire research paths dedicated to defense and offense. It is important to keep an eye on the map and monitor your pollution levels. If you can anticipate enemy attacks or take out bases before your pollution reaches them, there is not much to worry about. On the other hand, maybe this is just a way for us all to switch to green energy. Like the real world, it is possible to run your entire factory using solar energy but it will cost a lot of resources and real estate. This system is interesting and nice to have but I prefer playing on peaceful mode and just focus on building the optimal factory. Like most games, not everything is perfect. While the gameplay and ideas are great, the user interface and usability can use some work. The game’s interface looks ancient and as if it was just thrown together after working on the gameplay. It may not be the most enjoyable task to work on smaller things for usability and user interface but it is always the little things which take a good game and make it great. I hope to see a cleaner looking interface in the future. If you have not noticed by now, I am a huge fan of this game. I have not been as hooked as I am to Factorio for a long time. It is not often that we stumble upon a game which takes all of your attention and spare time (if only I had more spare time to give this game…). While the game is still in early access, it is very playable and can provide hundreds of hours of entertainment. The price is likely to rise as development continues so it is a good idea to pick this game up early. There is also a free demo available for you to try. Go ahead and check out the demo and say good bye to your free time. It is also important to note that the game does feature a multiplayer mode. If working on a factory with some friends is what you prefer, there is nothing stopping you from doing that. It will be a lot more difficult to properly plan everything if there are multiple minds working on it together but proper communication and planning can get around this. Besides, it is always more fun to play a game with some friends. I’m looking forward to what’s in store for Factorio’s future.